On Sunday 9th December, antifascists from all over the country gathered in London with the aim to oppose a racist and fascist demonstration, led by Stephen Yaxley-Lennon (aka Tommy Robinson). 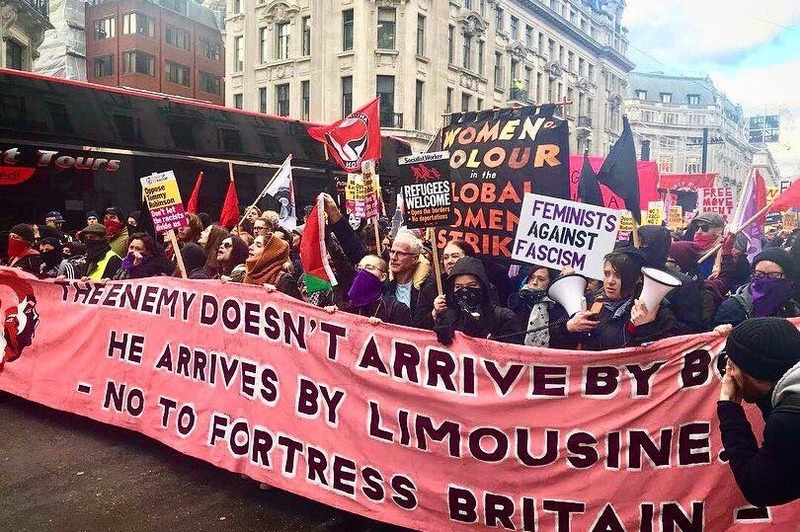 During this feminist-led protest, three antifascists were aggressively arrested. One of them is a member of the BUC who was consequently charged. These comrades were out in opposition to the increasingly frequent mobilisations of the far right in the UK. Tommy Robinson's propaganda represents a threat to our streets, our communities, and our struggles to build a society free from any sort of prejudice and discrimination. We Believe that fascism needs to be confronted and challenged in all its forms and manifestations. Therefore we are standing in solidarity with our comrade who could face a prison sentence and hefty fines - in the worst case scenario. In order to give him the best chance at fighting and winning his case we are trying to raise money to sustain the costs of the fines and the legal support. The State continue to try and control those who stand up to oppression and the threat of oppression. It is only through antifascist solidarity that we can keep them fighting with us. If you feel you can contribute please do so by using the link below, and look out for any fundraising events we will be trying to get organised.